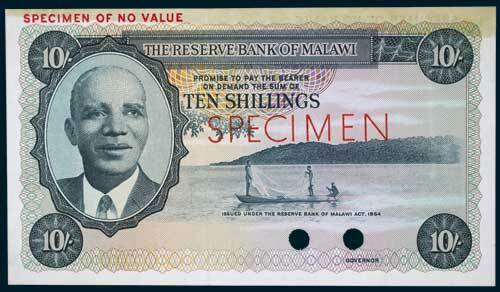 MALAWI, The Reserve Bank of Malawi, specimen ten shillings, undated (1964) colour trial, SPECIMEN horizontally in red front and back, SPECIMEN OF NO VALUE in red top left margins both sides, two punch hole cancellation at signature reserve, numbered 1 in top left margin on back (P.2s/ct). Glue remnants in top margins, otherwise virtually uncirculated. MACAU, Banco Nacional Ultramarino, one thousand patacas, 8 August 2005, AA 827695 (P.84a). Uncirculated.